One of the breakthrough artists at C2C 2017, following a stand-out UK debut there in March, Drake White makes a much-anticipated return for Country Music Week in October and a tour with Kip Moore. His widely-praised debut album ‘Spark’ (Big Machine Label Group) is out now and new single ‘Livin’ The Dream’ will be out October 13. Drake White’s debut album SPARK (Big Machine Label Group) immediately shot to No. 1 on the iTunes Top Country Albums chart upon its release last year and has earned praise from critics and fans alike. The 2016 Taste of Country Fan Choice Awards Album of the Year is a 12-track labour of love that showcases his exemplary songwriting with a rock-infused, organic Country sound and signature foot-stomp. It includes his first US hit single (and first UK single) “Livin’ The Dream”. White, who was named CBS.com’s 2017 GRAMMY® Artist of Tomorrow, has stunned crowds with his incredible live show and soulful voice, not least upon his UK debut at the Country to Country Festival at The O2, London in March 2017. Backed by his band The Big Fire, Drake has previously toured with superstars including Willie Nelson, Dierks Bentley, Little Big Town, Eric Church, Toby Keith and the Zac Brown Band. It is therefore no wonder that the Alabama native was featured in Rolling Stone’s 10 Country Artists You Need To Know as well as Billboard’s Hot New Country Artists to Watch and was chosen as one of the CRS New Faces for 2017. 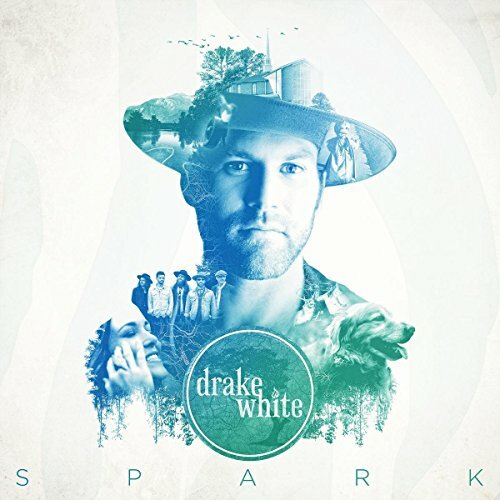 The SPARK album cover tells the visual story of who Drake White is as an artist, husband and native-Alabamian. The images imprinted into his silhouette paint a narrative of White's life, including his wife Alex, his hometown church where his grandfather served as preacher, his dog Writer and other mementos that inspired his first full length album. Recorded in Nashville, the Ross Copperman and Jeremy Stover produced project contains 12 tracks, 11 of which White co-wrote.